. Kokeshi, こけし / 小芥子 / 子消し wooden doll . Kokeshi dolls are quite famous and so we find many homepages concerning this item. This is an ongoing story and here is part 1 of it, concerned with a Daruma painted on a wooden doll with girl’s features. Wooden dolls of a similar type with only a Daruma face are called “Kiji Daruma” and will be introduced in their own story. There are so many HP about kokeshi, more than 5000 in English and 35000 in Japanese, so this is just a small selection. 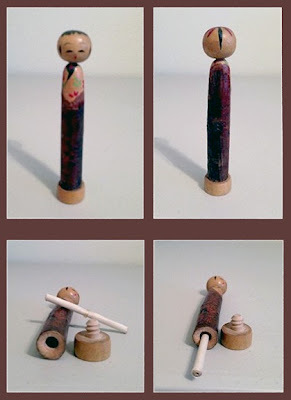 In part 1 (this one) you find general information about kokeshi and how to make them. Then the types of Miyagi prefecture are introduced. Part 2 deals with Tsugaru kokeshi, which feature many Daruma kokeshi too. Part 3 looks at Yamagata, Fukushima and some other famous kokeshi areas.
. Kokeshi こけし / 小芥子 / 子消し wooden dolls .
. Kokeshi with Daruma san　だるまこけし　/　ダルマこけし . 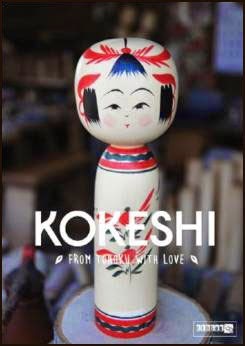 is a book that looks at the craft and culture of kokeshi dolls. Kokeshi are the traditional dolls that are made of wood and are characterized by their lack of arms or legs. They are produced in the Tohoku region of Japan and were originally a children's toy, although it is more often used as a form of decoration nowadays and displayed in the home. Abroad, they are considered to be an icon of Japan, and reflect Japanese aesthetic sensibilities with their simple, elegant and minimalist designs. Kokeshi have the appeal of imperfection and hand made exclusivity as no two dolls are the same, each kokeshi embodies the qualities of wood, something that is often referred to as "warmth.” In fact, for collectors, more than the freshly made kokeshi, many covet the atmosphere of the vintage kokeshi-- rather than degrading, as with plastic or artificial materials, the wood picks up a dewy, subdued colour and the delicately painted features fade gracefully with time. This book is the only English language book that looks at this culture in depth and is the only book with English language interviews with the masters of the craft. The author, Manami Okazaki, visits all 6 prefectures of Tohoku to profile 20 artisans in the remote hot spring villages where they are made. Included are the work and interviews with the masters to the up and coming artists, and highlights many aesthetic theories and sensibilities that are prevalent in contemporary design, even today. The book also looks at Japanese hotspring culture, and Tohoku culture to paint a holistic picture of kokeshi culture. This book will delight fans of wooden crafts, Japanese culture and travellers to Japan. The book gives an insight into the psychology of the craftsman, the process of production, the motifs and the various types, which will inform the collector. This book will also suit travelers to Japan who wish to explore the Northern region of Japan, and their charming hot spring villages. Included are hundreds of photographs. This book is intended for charity and all proceeds will go to schooling in Tohoku post March 11 tsunami. Almost everyone familiar with Japanese dolls knows about kokeshi. 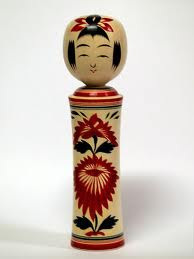 The cylindrical wooden dolls without limbs are created on lathes and are brightly painted with floral designs and a girl's face. Most people look at kokeshi and wonder how what is basically a cylinder of wood with a ball stuck on could be a play doll. Kokeshi dolls originated in the northern region (Tohoku, Toohoku東北) of Honshu (the main island). Many people believe that early kokeshi were representations of girl children that were aborted or put to death after childbirth due to the inability to support a poor family of greater size. Even the word, ko-keshi (ko o kesu 子を消す), can be loosely translated as "extinguished child" or “a child wiped out”. The medochi use human females to have them bear their children. When the child is born, the Medochi comes to claim his child. If the woman throws the baby into the water to kill it, Medochi takes the bones with him.
. Medochi　メドチ，　めどち Kappa, water goblin . It may be that kokeshi were kept as reminders of a dead child's plaything. Kokeshi are also given as charms to childless women in an effort to get pregnant. Kokeshi were kept in the family and passed down from generation to generation. 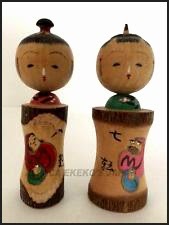 Some believe that kokeshi date back three hundred years and were the north's equivalent of the standing hina dolls. 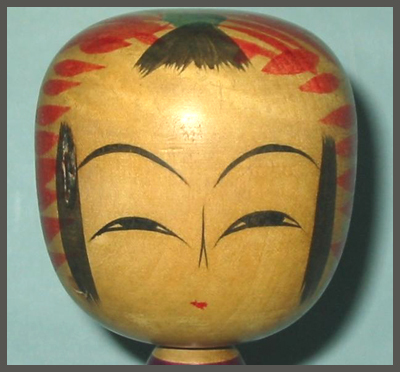 Some kokeshi dolls have their heads made from the same piece of wood as the body, however most heads are separate. They are attached by heat friction with the body rotating on the lathe while the head is fitted on the spindle that holds the head. The wood surrounding the hole at the base on the head eventually cools and contracts to a snug fit. Supposedly the sign of a good kokeshi is a head that squeaks when rotated, but some are just made to do that. Their nickname is “Kina-Kina-Ningyoo”, roughly translates as “Squeeking, Squeeking Doll”. Hijiori, Kijiyama, Tsuchiyu, Togatta, Naruko, Yajiro, Sakunami, Nambu, Tsugaru and Zao Takayu. Each area has its own manufacturing technique, decoration, and head and body shape. The Meiji period saw increased affluence of the middle class which increased travel and sight seeing into the Tohoku area for its other abundant resource, hot springs. Some hot spring areas sell souvenir kokeshi, each with their own characteristics. Keep reading about Kokeshi and many other Japanese dolls on this very informative homepage. 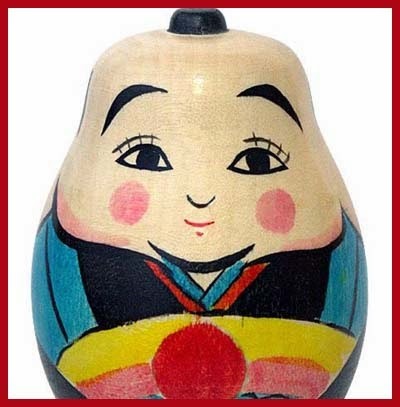 Judy Shoaf from JADE also writes about Japanese dolls, Kokeshi and Daruma. See her LINKS for more. On this HP you find more about the local kokeshi of northern Japan. Some will be discussed in part 2 in more detail. This page is about Traditional Crafts of Japan, with a lot of useful stories and a search button. On the following HP you get to the different dolls of Naruko, Yajiro, Togatta and Sakunami. Click the buttons MAIN TEXT to get to the details of the dolls and their makers. This little tour is well worth your while. The woodcutters who worked the remote mountains didn't have money for luxuries like fine dolls, but whenever there was an extra scrap of wood, they would turn it on a lathe and create a doll complete with eyes, nose, and mouth, much to the delight of their children. The best wood for the kokeshi is the dogwood, maple and poplar. The trees are 15 to 20 years old and are cut in late September to mid October. The trees are dried for 15 days to a month and then the branches are removed to ease transportation. When moved, the bark is removed to prevent black stains in the wood. The wood is then stored for approximately half a year. Once the drying process is complete, the wood is cut into sections, the lengths of the kokeshi. A circular saw is used to remove the facets so that each piece can be worked on the lathe. The head and torso are made separately, but the steps are the same. The head (or torso) go through a rough lathe shaping, then a fine shaping. Lathe lines are incorporated at this point, then the facial features and decorative patterns are painted, a wax polish applied, and the head and torso are fitted together. There are about thirty-nine steps in the manufacturing process to turn a tree into a kokeshi. Of the approximately 220 kokeshi makers very few are young men and the craftsmen worry about the lack of successors. In an effort to stir up interest in the younger generation, an “All Japan Kokeshi Contest” is held every year. In Miyagi there are 5 varieties of kokeshi, made in Naruko, Togatta, Yajiro, Sakunami and Hijiori. The production is the highest in Japan. The Kokeshi Dolls - originated with a warm heart, abundant climate, and dexterous skill in Michinoku.With a gentle beam,they are inviting us to the five Kokeshi towns. Let us look at them in detail. The pronunciation can also be “Narugo”. The central street of Naruko Hot Spring resort is called "Kokeshi Street". Along this narrow hot spring street, inns and souvenir shops stand in a row. In the stores, displayed in a crowded fashion are, of course, kokeshi dolls. Some stores are operated directly by the wood artisans, and you can actually see them skillfully working. The unique feature of the Naruko-onsen-kyo Hot Spring Village is that visitors can enjoy hot springs with varying characteristics, and which have a reputation for the health benefits to be gained from them.The hot spring village consists of five hot spring areas: “Naruko Hot Spring," “Higashi-Naruko Hot Spring," “Kawatabi Hot Spring," “Nakayamadaira Hot Spring," and “Onikobe Hot Spring," and each of them provides baths of great individuality.
. Eight old Hot Springs 八古湯 . Togatta is maybe the most ancient birthplace of Kokeshi. The Nihon Kokeshi-Kan (Japanese Kokeshi Museum) in Naruko, the Kokeshi-no-Sato (Home of Kokeshi) and the Miyagi Zao Kokeshi-Kan (Miyagi Zao Kokeshi Museum) in Togatta displays the dolls. Kokeshi artisans perform workshops at Kokeshi-no-Sato, allowing you to watch the kokeshi making process. Yajiro Kokeshi are produced mainly in the village of Yajiro located about 1 km west of the Kamasaki Hot Spring of Shiroishi Town. They have their origin with Togatta Kokeshi. Today in Yajiro, the people live as half farmer and half artisan, farming the land from early spring to autumn and striving to produce Kokeshi from late autumn to spring when the icy chill moves off the river. "Creative Kokeshi" is a handicraft that exercises the free and unrestrained imagination of an individual artist. After World War II these dolls are crafted using the original techniques of engraving and baking, and are appreciated as a unique work of art. Sakunami Kokeshi have a relatively short history, and is considered that they were first produced in the early Meiji era. They are quite slender, so that children can hold them easily. The Hijiori design was developed in the Hijiori Hot Spring resort in Okura Village. The main colors for decoration are yellow, red and green and the eyes are carefully modelled. The Togatta design was combined with the Naruko design to produce the distinctive Hijiori Kokeshi. This design presently has the least number of the artisans. However, Shoichi, a third generation artisan, is creating ambitious pieces in Sendai. His inspiration comes from the master craftsman, Shusuke Sato, who was from Togatta and said to be the originator of Hijiori Kokeshi, and the second generation Minosuke. If you speak Japanese, you can try your hand at making a kokeshi yourself, choosing one of the two masters who offer their instructions. A Day in Kokeshi Land by Laurel M. Sheppard of JADE. And here is a collection of many essays in Japanese about kokeshi.
. - Mingei - Folk Art - . Dolls made from all kinds of natural material and seeds. kusa ningyoo 草人形 "plant dolls"
. kusa ningyoo 草人形 "plant dolls" from lotus seeds .
. oiran kokeshi　花魁こけし　kokeshi geisha wooden doll .
. tsubaki no hana 椿の花 camellia blossom art motives . Next read part 2 and 3 of the Kokeshi story. of kokeshi dolls . . .
kokeshi mailer used to send a letter to a special person ! Kokeshi with a tatami robe . . .
Kokeshi on sandals . . .
. Hi no yoojin 火の用心 fire prevention kokeshi .
. Join the Kokeshi Gallery of facebook . This book tells the story of a society reversing deeply held worldviews and revolutionizing its demography. In parts of eighteenth-century Japan, couples raised only two or three children. As villages shrank and domain headcounts dwindled, posters of child-murdering she-devils began to appear, and governments offered to pay their subjects to have more children. In these pages, the long conflict over the meaning of infanticide comes to life once again. Those who killed babies saw themselves as responsible parents to their chosen children. Those who opposed infanticide redrew the boundaries of humanity so as to encompass newborn infants and exclude those who would not raise them. In Eastern Japan, the focus of this book, population growth resumed in the nineteenth century. According to its village registers, more and more parents reared all their children. Others persisted in the old ways, leaving traces of hundreds of thousands of infanticides in the statistics of the modern Japanese state. Nonetheless, by 1925, total fertility rates approached six children per women in the very lands where raising four had once been considered profligate. This reverse fertility transition suggests that the demographic history of the world is more interesting than paradigms of unidirectional change would have us believe, and that the future of fertility and population growth may yet hold many surprises. “One of a kind” wooden doll becomes a big boom! The origin of the Kokeshi doll is a mystery. It has been said that the Kokeshi doll started in the Tohoku district in the late Edo or early Meiji period, but there are various opinions about the birthplace. 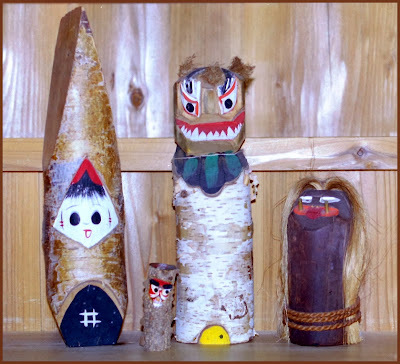 The wood crafters of the mountainside villages made it as a toy for children, and the dolls have unique designs and features rooted in each region. special about kokeshi from Sendai. - almost a Daruma grizzly ! in our facebook gallery ! Nowadays it [kokeshi] is something for adults, how did that come about? Kokeshi weren't originally called "kokeshi" in the past, the ones from here were called kiboko, and in Iwate they were called kinakina -- all the types had different names. The name "kokeshi" came about in 1940, when they became popular in Tokyo. If the 'Koujin' took an order, the meaning wasn't getting through with all these different names, so everyone got together in Naruko and decided to call these dolls "kokeshi" in hiragana (Japanese alphabet) with three letters. The word actually has no meaning and that is why there is no corresponding kanji (Chinese character). This is in contrast to words like "kiboko" which refers to "ki," which is wood and we call small children "oboko." Sometimes, people say that kokeshi means "ko" which is "child" and "keshi" which means "to erase," so they suggest it is used to memorialize dead children -- that is not true and it is problematic! I have heard that being said on the radio and I want them to correct it. Originally, kokeshi were made by people who were making bowls and they came from the west and was transmitted all the way up to Aomori prefecture. They were called 'kijishi' and would receive a license under the emperor -- you can see an example of one of these licenses at the Naruko Kokeshi museum. Having said that, it is really strange that kokeshi are only prevalent in Tohoku. The youngest strain of kokeshi, first procured in the Taishō period (1912-1926), is the Tsugaru strain which was born (and is centered) in Nuru Hot Springs in Kuroishi City, Aomori Prefecture, and Oowani Hot Springs in Oowani Town, Southern Tsugaru County, as well as in other areas nearby (Shibata 1999: 33 and Takahashi 2003: 18). As with other kokeshi-producing regions, Tsugaru has created an origin story for its kokeshi, making it unique from other kokeshi strains. The Tsugaru Kokeshi Museum’s pamphlet states that in Tsugaru there were wooden children’s pacifiers called nameribō and an object of folk belief (minkanshinkō no taishō) called yama naka sansuke ningyō which may be considered as the origin of kokeshi, but at this point in time there wasn’t anything in the world recognized as a kokeshi (Tsugaru Kokeshi Kōjin Association 1994: 3). This strain, though, has many of the features of the Narugo strain as there were exchanges between artisans there. The two main designs or sub-strains are the Nuruyu Mori sub-strain with a straight body and widening bottom, and the Ōwani design with a straight body and visible shoulders. 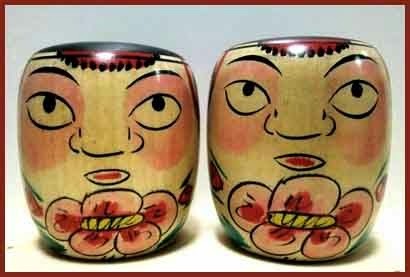 For both designs, one piece of wood (tsukuritsuke) is used and the head may be black with the okkapa hair design, painted with red decorations, or tegara that resemble the Narugo strain. 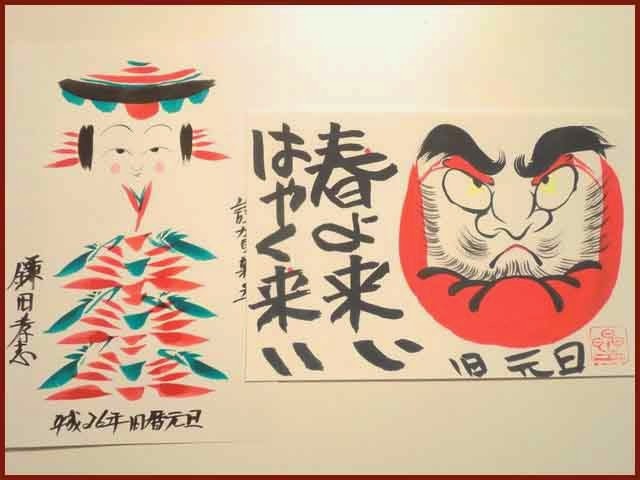 The body design may have hand-drawn chrysanthemums, peony, camellia, or iris (hayama) designs, but there are also dolls with the nebuta daruma design, lathe lines, kogin moyo (small cloth or clothing design from the Aomori area) or design motifs from the Ainu culture. The Nanbu strain was developed in the old Nanbu territory which is now part of Iwate Prefecture. Iwate Prefecture production centers can be found in the cities of Hanamaki and Morioka City. The head of this doll is the loosely fitting hamekomi and is characteristically called kina kina, a name used for wooden baby toys and pacifiers. The kina kina style is well known for its loose-fitting head which is inserted into the body, allowing it to move freely back and forth like a rattle, making a sound Japanese describe with the onomatopoeia, gura-gura. These basic types are called sōboku no kishi (simple style) and were developed from oshaburi (pacifiers), but were not colored so as to not harm children when they played with them. It was only later that form and coloring influences from Narugo and Tōgatta were added, though many dolls remain unpainted today. It was mainly the artisans of Hanamaki who developed the dolls with color (Shibata 1999: 32). In Tono, Miyako, in Shidōtaira, the dolls have heads that can be twisted back and forth like the ones in the Narugo strain (Shibata 1999: 32). Several artisans living in Iwate Prefecture producing Nanbu stain also produce several other strains of kokeshi as well. Takahashi states that Nambu strain is too narrowly defined as it contains makers who make several strains at a time and may need to be revised (2003: 17). 20 and the red radiating finger designs. The torso was first and still is decorated with a simple chrysanthemum pattern, as originally designed, but a kimono apron pattern (maedare moyo)21 with plum flowers was created in Kijiyama and Imagawa (Akita Prefecture), along with cherry and chrysanthemum flowers to create a vertical striped kimono pattern (Shibata 1999: 31). The Yamagata strain was founded by Kuraji Kobayashi who traveled to Sakunami around 1860, to study wood working with Iwamatsu Naosuke, later returning to Yamagata in the early Meiji period (around 1868) to produce his own kokeshi (Shibata 1999: 30). Mr. Kobayashi had many apprentices, and his teaching influences are still reflected in current Yamagata kokeshi. While the Yamagata kokeshi is based on the style of the Sakunami kokeshi, utilizing similar cherry blossom motifs, floral patterns of the Yamagata plum are also painted on the bodies of the dolls, reflecting a deeper Yamagata connection and evoking the atmosphere of Yamagata City (Takahashi 2003: 15-16). The head is sashikomi and on the top of the head is painted the single black hair and ring-shaped decorations (tegara) surrounding it like Sakunami strain, but there are a greater number of rings, more similar to the radiating lines of the Tōgatta strain. Originally the characteristic of this line was a doll with comparatively narrow body compared to the head, but lately the body is wider and lathe lines may be drawn on the top and bottom of the body. Some artisans still do not use the lathe lines as the old styles do not have them, and instead create incised lathe lines (kannamizo -鉋溝). The Zaō strain was first produced in Zaō Hot Springs in Yamagata City, Yamagata Prefecture, when professional wood working began in the region during the late 1800s, after Eijiro Okazaki returned from training in Aone (near Tōgatta) and opened his business (Shibata: 1999: 29). The Zaō strain’s resemblance to the Tōgatta strain is not a coincidence as Mr. Okazaki, during his training in Aone, worked closely with wood turners who specialized in this kokeshi strain (Shibata 1999: 29). Gradually, wood turners in Zaō gave their kokeshi a unique style with a profound fat body, red linear decorations radiating on the top of the head (tegara), or a black okappa hair style. The head is sashikomi, but, unlike the Tōgatta strain, it does not feature the “eight” shaped decoration on the front of the head. While the center of production is still in the Zaō region, this strain is also produced in Uenoyama in Yamagata. Unique wind-blown cherry blossoms (sakura kuzushi) are also painted on this strain, similar to but unique from the tumbling cherry blossoms painted on the Tōgatta strain. The design of this strain is also influenced by the Tsuchiyu strain, as some dolls have snake eyes painted on the top of their heads and some are narrow at the bottom of the body or waist. Occasionally, various plants, grapes, corn, or peonies are painted on the body (Shibata 1999: 29). The Hijiori strain was first produced in Ōkura town in Mogami County at the Hijiori Hot Springs (the production center) in Yamagata Prefecture (Shibata 1999: 22 and Takahashi 2003: 16). The Hijiori strain was said to have been started by Kakizaki Denzō who learned to make kokeshi in Narugo, later returning home to start his own kokeshi business around the late 1870s (Meiji 10) (Shibata 1999: 48). Inoue Tōgorō, an apprentice of Kakizaki Denzō, also trained at the Tōgatta Hot Springs to learn new techniques. This collaborative training resulted in a unique kokeshi which has the upper body of the Narugo strain with wider shoulders, straight body, and thicker bottom, and the color motifs and body construction (sashikomi) of the Tōgatta strain (Shibata 1999: 48). The use of radiating decorations at the top of the head (tegara) as well as the eight-shaped face design and decorations that graduate along the head like a mountain range resemble the Tōgatta strain. Like the Narugo strain, this doll also features raised or recessed painted lathe lines and a slightly “stretched” shape at the bottom of the doll. In the Taishō period (July 1912 to December 1926), red and green radiating lines were added (Shibata 1999: 48). Many dolls also have several design elements such as green painted shoulders, red lathe lines on the top and bottom of the body, or yellow painted bodies. The body decorations consist of layered chrysanthemum flowers (kasane kiku), “confused bloom” (midarizaita) chrysanthemum pattern, or Dianthus (sekichiku - 石竹). The appearance of all the confused or seemingly jumbled chrysanthemum flowers is often referred to as called Hijiori chrysanthemum (hijiori-giku) as this pattern is indicative of this doll. In Figure 11, the last two dolls on the left, which were created by Satō Kiku and her son Satō Shōichi, are similar in design and facial features, while the second doll from the left was made by Satō Shōnosuke, uncle of Shōichi. The Sakunami strain originated in Sakunami (also the production center) in the Aoba Ward in Sendai City, Miyagi Prefecture. Early on in the study of kokeshi history, it was recorded that Kuraji Kobayashi, the founder of the Yamagata Strain, studied in Sakunami but, more recently, greater evidence of Sakunami’s woodworking industry in the last years of the Edo period and coupled with clarification on kokeshi artisans’ genealogy, Sakunami is now recognized as the earliest production center of kokeshi, also making it the oldest strain of kokeshi. Historically kijishi made kokeshi in this area, but production lapsed until its reintroduction by Hiraga Kenzō who, along with Kobayashi Sōji, trained in Yamagata with Kobayashi Sōkichi. Hiraga Kenzō, after returning to Sakunami, revived the old Sakunami kokeshi unique from Kobayashi’s Yamagata strain, according to older residents in the region (Shibata 1999: 27). The Sakunami kokeshi can be distinguished from other strains by its top-heavy construction with a large head and thin tapering body. This design, while impractical for displaying on a shelf for a collection, echoes its original purpose as a wooden doll for play which was easy for children to grasp with their small hands. Now, some dolls will include a small wooden stand that can be attached to the thin bottom of the doll so that it can be displayed along with other kokeshi. The Sakunami strain is similar to the Tōgatta strain because of this top heavy form and sashikome connection. On the top of the head there is one black hair drawn with red ring decorations (a form of tegara) surrounding this one hair. Sometimes these red ring decorations are omitted for an all-black okappa hair style. On the body of the doll various flowering plants (kusabana - 草花) that resemble crabs (kani) are painted with purple and green stems and leaves. This design is said to have been revived by Hiraga Kenzō from the old Sakunami kokeshi (Shibata 1999: 46). Now, there are many with thin lathe lines and wave- shaped lines (nami gata) painted on the upper and lower body. Recently, some artisans omit hair decorations for smaller versions of the doll and ejiko, and instead paint wide “hat” shaped red lines (akai boshi) in rings to represent a beret pattern (Shibata 1999: 46). In Sendai, Takahashi Hōkichi is said to have continued his Father’s tradition of making another form of Sakunami strain kokeshi with chubby red and black peony-like flowers painted thickly (bottari to kaku-ボッタリと描く)18 on the body of the doll. The design of the head and body resemble the Hiraga family’s kokeshi with its top heavy-ness and thin tapering body. The Narugo strain originated in Yumoto (one part of Narugo Town) in Tamatsukuri County, Miyagi Prefecture, with the production center being Narugo (Shibata 1999: 26 and Takahashi 2003: 14-15). It is said that the Narugo kokeshi was founded by Ōnuma Matagorō in the late Edo period. Distinctive features of this kokeshi are a somewhat thick body with slightly tapered shoulders and narrow eyes. The head is generally hamekomi which allows for the head to be twisted back and forth making a kyu-kyu or ki-ki sound. This type of connection is created by first turning a small ball-shaped connector on the neck portion of the head. Next, a hole is drilled into the upper part of the body. The entrance to the hole is made very tight so that the head can barely squeeze in as it is being pushed into the body as it is spinning on the lathe at high speed. The high speed of the lathe creates the friction needed for the ball neck connection to be pushed into the body as the body expands. As the body of the doll cools down, the head and body connection shrinks and the head cannot be pulled out. The sound that the head makes may be slightly unpleasant to some ears, but it is a major selling point and recognizable feature of the Narugo kokeshi. On the train and bus there are announcements about this specific feature, and while I was sitting down to breakfast at an inn there, I found that several women had painted their own kokeshi the day before. The women ran up to their rooms and came back carrying their kokeshi. These women had traveled to Narugo via Tokyo for a vacation, and while they had been unaware that there was a kokeshi festival going on, had joined in and painted kokeshi as a typical souvenir of the area. One of the women’s kokeshi was silent when she turned its head back and forth and she openly expressed disappointment. Another woman took the doll and, after some time, was able to get it to make the ki-ki sound. The doll’s owner was so happy her doll finally squeaked that she exclaimed, “I was glad” (ureshikatta!). Soon the entire breakfast room was filled with the ki-ki noise as others got out their kokeshi and began to turn the heads back and forth. This sound is such an important feature of this kokeshi, that without it, in many ways, the kokeshi ceases to have value. 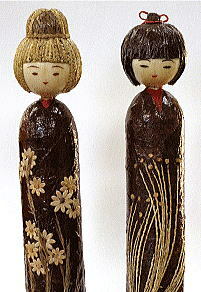 Smaller Narugo kokeshi have a “built-in style” (tsukuritsuke) either called a standing child (tachiko - 立ち子) or Jizō form (jizōgata). The body is generally wider at the bottom with one or two painted lathe lines. The top of the body features semi-circular shaped shoulders with color enhanced tool marks or lathe line decorations (kanamizō) adding a decorative detail to either the neck of the doll or creating an obi (sash for the kimono) effect in the center of the body (Shibata 1999: 43). Stylized chrysanthemum flowers, uniquely designed by each family in the region, are often painted on the front of the body, each flower painted below the next so that the design can be seen vertically. The most prevalent chrysanthemum pattern, as for the Tōgatta strain, is the layered chrysanthemum (kasane-giku). Other chrysanthemum patterns used are the pin wheel pattern (kazaguruma-giku), chrysanthemum seen from underside (ura-giku), front side of the chrysanthemum (shōmen-giku), three painted chrysanthemum (sankaku-giku), gathered chrysanthemum (yose-giku), water chestnut chrysanthemum (hishi-giku), Itō family chrysanthemum (Itō-giku), and wheel (old style cart wheel) chrysanthemum (kuruma-giku). Maple leaf designs (kaede) are also prevalent, while flowers such as Dianthus (nadeshiko)17, Bell flowers (kikyō), Iris (ayame), and peony (botan) may be featured on the body as well. 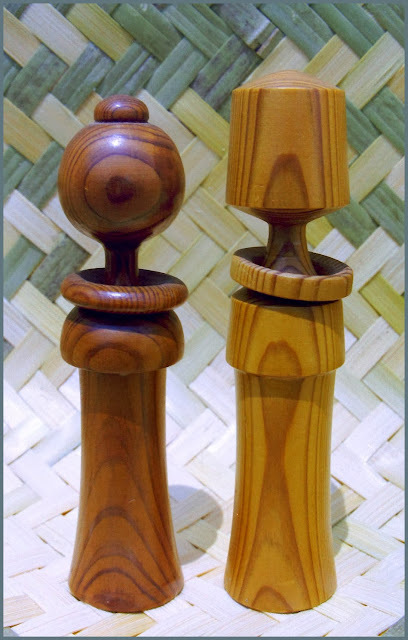 Traditionally, kokeshi with just lathe lines were made. For the head design, the bangs are thinly separated and there are red decorations in the center called mizuhikite. The sitting down kokeshi shape representing a baby in a basket (ejiko or ijimeko) can be seen in all strains of traditional kokeshi, but the nemariko, an elongated ejiko form, was uniquely created in Narugo. Due to the large numbers of artisans making this strain of kokeshi, Narugo is also recognized as a major region of kokeshi production, and, for many, these artisans provide the image of what a kokeshi is. The overall stable form of this kokeshi makes it a popular decoration among Japanese because it does not easily fall over during earthquakes, and because its solid craftsmanship can be seen as a metaphor for the stability of the home. The mainstream design for this strain has a yellow body with wide lathe lines and red brush strokes indicating the collar and lower opening of a kimono. The makers of the Yajirō strain are known for their use of two or three color combinations on the torso and a multi-colored beret pattern (bere bōjō) on the top of the head of the doll. These designs and the thickness of lines used vary from family to family. Also, “ear shaped” half circle decorations (hojō hanenkei) are painted along the bang line of the doll. 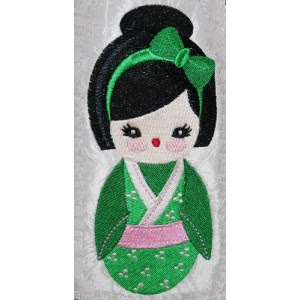 In the past, a very thin okappa hair decoration was painted below the beret decoration, but recently this design has been omitted on many dolls. Mainstream dolls for this strain feature half-moon (hangetsujō fusakazari) decorations painted along the bang line of the face, but some feature small bangs, red vertical bars (akai tate sengun), or the kanji eight-shaped hair decorations (hachi no ji no kami kazari) that resemble those of the Tōgatta strain (Shibata 1999: 40). The side hair decorations are mostly three to four red horizontal lines, but there are some with lines added, or ear designs (mimi-gata). More elaborate dolls may feature a scarf (eri maki), top knot (mage kashira), or umbrella hat (kasa suki). The Yajirō strain of kokeshi in Figures 7 and 8 shows a broad range of the kokeshi produced in the area and traits passed from family member to family member and teacher to student. In Figure 7, the first doll on the left is by Satō Yoshiaki, a member of the same family under whom Inoue Yukiko (second kokeshi from the left) trained as an apprentice. Similar facial characteristics can be seen in kokeshi created by her daughter, Inoue Harumi (fourth kokeshi from the left), who trained under her mother and father. The last two dolls on the right are by Nīyama Mayumi (smaller kokeshi), who trained with her husband Nīyama Yoshinori (last kokeshi on the right). The Tōgatta strain’s origins are from Shinchi in the Tōgatta Hot Springs in Zaō Town of Tōgatta County, Miyagi Prefecture (Shibata 1999: 24 and Takahashi 2003: 13-14). The center for production is in Aone, in Tōgatta. A long history of lathe work and the making of wooden products in Shinchi, Tōgatta, can be traced back to the middle of the Edo period from records left in woodworking villages there. From this history it was found that woodworkers created kokeshi to be sold as souvenirs at the nearby, then developing, Tōgatta Hot Springs. The distinguishing 41 are painted on the whole top of the head with large wave shapes (name gata) or mountain-shaped lines (mitsuyama) on back of the head (Shibata 1999: 37). Smaller dolls might have butterfly decorations on the top of the head and, very rarely, they sport an all-black head (okkapa). A kanji numeral eight-shaped decoration (八) is drawn from left to right on the front of the face, and bangs which are split in two. The eight-shaped decoration usually ends at the bottom of the bangs, but there are some dolls on which these lines continue as thick parallel decorations. This head decoration is unique to the Tōgatta strain. 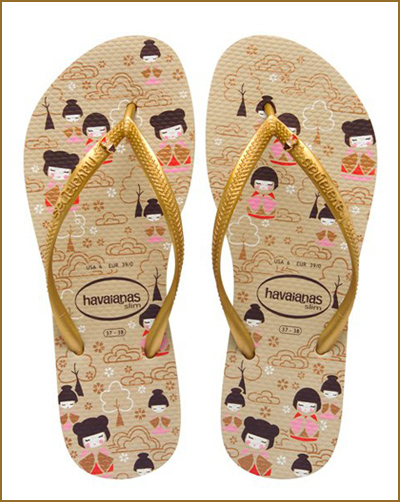 The primary decoration on the body is the layered diamond or triangular shaped chrysanthemum pattern (kasane-giku). Other dolls are decorated with a rising sun chrysanthemum pattern (asahi-giku); a top view of the chrysanthemum, often with red or yellow dots in the middle of the red petals (omote-giku); underside of the chrysanthemum, often with a green dot in the center of the flower (ura-giku); soft or long petals of the chrysanthemum fluttering in the breeze (bota-giku); weeping chrysanthemum (shidare-giku); and diamond-shaped chrysanthemum (hishi-giku). In addition to the chrysanthemum patterns, plum designs are popular, including plum flowers and branch (eda-ume) and scattered plum flowers. The tumbling cherry flowers (kuzure-zakura) design used is unique to Tōgatta and can differ from artisan to artisan. This cherry pattern usually occurs with the painted neckline of a kimono (kin). Non-floral designs include wood grain design (mokume) and a wooden frame shaped like the kanji “i - 井” called (igeta - 井桁). This strain still features a few dolls with just lathe lines as well. In addition to designs on the fronts of dolls, some larger dolls also have designs on their backs featuring plum flowers (ume), iris (ayame), or peony (botan). Tōgatta strain kokeshi produced at the Akiu Hot Springs in Miyagi Prefecture feature the unique design elements of thick green lathe lines on the top and bottom of the doll’s body, sometimes lending these dolls the specialized label Akiu form (Akiu gata). After the Meiji era, Shinchi (near Tōgatta) developed into an advanced production site for woodworking in North Eastern Japan, greatly influencing the creation of the Yajirō, Zaō, Hijiori, and Nanbu strains of kokeshi. The Tsuchiyu strain originated in Fukushima City, at the Tsuchiyu Hot Springs in Fukushima Prefecture. The founding maker of the Tsuchiyu kokeshi, Sakuma Kamegoro and his son, Yashichi, called this kokeshi “deko”. Yashichi’s son, Asanosuke, developed the unique and skillful techniques for making the Tsuchiyu strain which are still practiced today (Shibata 1999: 23 and Takahashi 2003: 12). 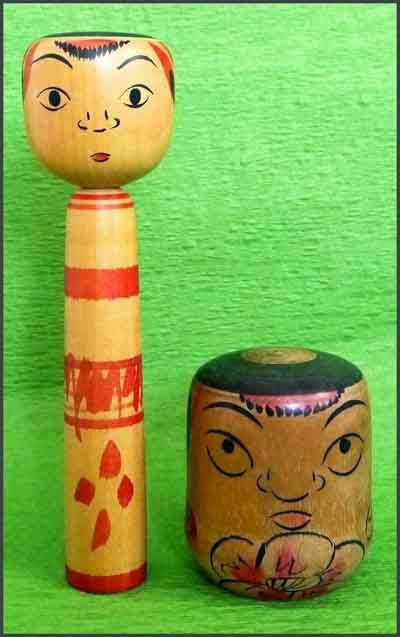 The distinguishing characteristics of the Tsuchiyu kokeshi are a tightly fitting head to the body (hame komi), and black circles called snake eyes (hebi no me) which are painted on the top of the head of the doll while it is still on the lathe. While the forms of the Tsuchiyu kokeshi vary greatly from artisan to artisan, in general the doll’s face is comparatively smaller compared with other kokeshi strains, and the torso is thin. The bangs painted on the front of the face of the doll are comb shaped (kushi gata - 櫛形), resembling the teeth of a comb, with the addition of red designs the right and left sides of the head. The eye lids are generally double layered/edged and the nose is round. The body of the doll is thinner than the head and may be wider in the middle as the body tapers from the neck down. This kokeshi’s striped designs on the body are painted while still on the lathe (rokuro sen), either straight lines (rokuro moyō) or reverse lathe lines (kaeshi rokuro) that zigzag on the body, and, occasionally, flowers are painted after the doll is taken off the lathe. Tsuchiyu Strain from Left to Right: 1) Lathe Lines and Iris, 2) Reverse Lathe Lines, 3) Lathe Lines and Flowers, 4) Lathe Lines and Flower, 5) Reverse Lathe Lines with Umbrella Hat. n the final years of the Taishō period (late 1920s) at Inashiro Town in the Nakanosawa Hot Springs in Fukushima Prefecture, a kokeshi maker named Iwamoto Zenkichi introduced a new form of kokeshi into the Tsuchiyu strain, now called the Nakanosawa sub-strain, with the pet name of tako bōzu (Saitō 1989: 38). This form is easily recognized by the pink circles surrounding the large eyes of the doll, and has continued to be made by several of Iwamoto’s successors. Characteristically the tako bōzu group is similar to the Tsuchiyu strain but the facial expression can be considered grotesque, and there are some dolls that have different colors of snake eyes drawn on the top of the head (Saitō 1989: 38). Zenkichi’s kokeshi design was continued by his son, Yoshizō, who trained about ten apprentices. After Yoshizō passed away, his apprentices made a group called Tako Bōzu no Kai (Tako bōzu Association) and continued to keep this form alive. As this form of kokeshi differs greatly from the other Tsuchiyu strain kokeshi, collectors and the Tako bōzu Association may recognize this form as a new strain (Saitō 1989: 38). Shirley Funk states that this doll is based on a papier maché dance figure Iwamoto Zenkichi used in his performances (Funk 2003: 9). However, Iske Stern prefers the alternate interpretation that it was thought that, during the Edo period, a street dancer danced upside down on his hands. This dancer had a cushion on which a face with large eyes was painted. Due to its popularity, people demanded a doll with the same face painted on it (Stern 2003: 50). Both of these sources’ suppositions are correct in that Iwamoto Zenkichi, as part of his family’s geikoya performance, used a papier maché pillow placed between his knees while he did “upside down leg dancing” (Shikama & Nakaya 1971: 54). On this papier maché form he had painted a “grotesque” face (Sikama & Nakaya 1971: 54 & 391. Collectors’ affectionate name for this sub-strain -- tako bōzu -- means Buddhist monk’s shaved head, or, more generally, anyone who has a shaven head referring to a Buddhist priest. Tako is read as octopus, and jokingly people with shaved heads are called tako as their heads look like the smooth top of an octopus’ head. 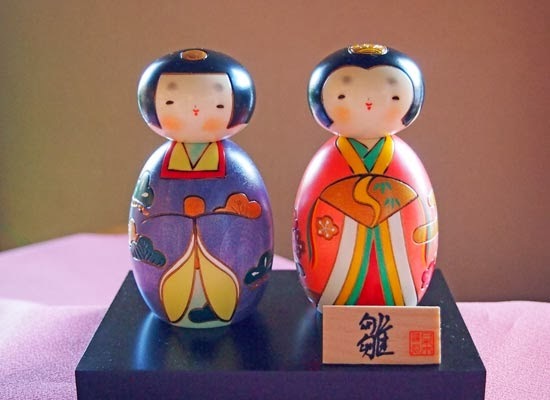 Although primarily a mainland tradition, contemporary kokeshi can be found as far south as Okinawa in the town of Haebaru where “miyarabi” kokeshi are modeled after Ryukyu princesses. Residents of Taiki Okinawa, a center for physically disabled persons, have been crafting and selling unique Okinawan-style kokeshi to support the facility ever since a craftsman passed the skill on there more than 30 years ago. “Miyrarabi kokeshi represents the lifestyle of Okinawa and are painted with traditional (Ryukyu) patterns,” says Taiyo No Machi’s Kiyoshi Nakamoto. Woodblock prints of kokeshi and paper dolls . 2. Kaoru Kawano 河野薫 (1916-1965), Kokeshi Doll - 2, ca. 1950-60 (this item: Posthumous strike), large oban - 大大判, 23.2 x 38.0cm (image size); Kaoru Kawano was a very popular artist for his distinctively styled depictions of figures, especially children. He uses the wood grain patterns to lender the textures and the mood to the works. 3. Ikeda, Shuzo 池田修三, Paper Dolls - 紙人形, 1967 (this item--posthumous strike), large oban - 大大判, 27.8 x 39.9cm (image size), edition 8/150. 4. Kuriyama Shigeru 栗山茂, Japanese (Tokyo, b. Asakusa district, 1897 - 1973), Kokeshi to Oiran, Toys No. 1, dated 1957, dimension, H. 55.9 x W. 38.7 cm (22 x 15 1/4 in.). - The year 2017 !